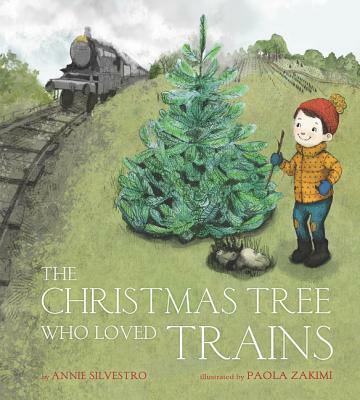 A poignant Christmas tale about a tree who loved trains, and a little boy who loved them, too. A pine tree grew in the farthest corner of the tree farm on a small patch of land that bordered the train track. The tree loved trains. She loved to watch them ZOOM by on the tracks beside the tree farm. Her branches would ripple in the wind as the trains roared past. Beautiful art from Paola Zakimi brings to life this lovely Christmastime tale from Annie Silvestro, perfect for readers who love The Giving Tree and The Velveteen Rabbit. Annie Silvestro is a book lover who reads and writes as much as possible. She can often be found shuffling piles of books around so she has a place to sit or someplace to put her teacup. Her picture books include The Christmas Tree Who Loved Trains, illustrated by Paola Zakimi, Bunny’s Book Club, illustrated by Tatjana Mai-Wyss, and Mice Skating, illustrated by Teagan White. Annie lives with her family by the beach in New Jersey. Christmas is her very favorite holiday. Visit Annie online at www.anniesilvestro.com. The story is sweet without being saccharine, and the illustrations, in soft greens and bright reds, are homey and warm.